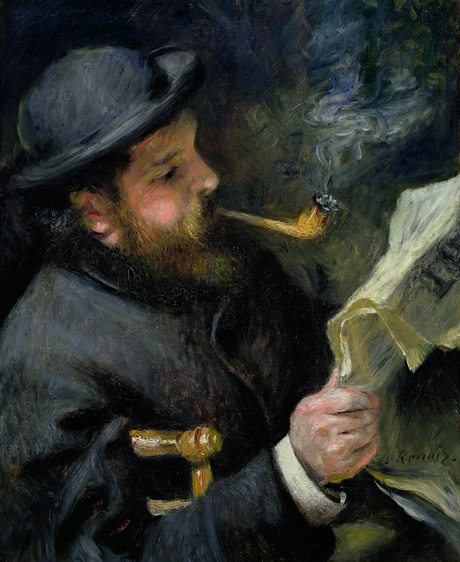 A portrait to ponder by French artist Pierre Auguste Renoir (1841-1919) of fellow artist Claude Monet reading while puffing away on his pipe, which was painted in 1873, welcomes the viewer to Monet’s Garden, the truly superb Winter Masterpiece exhibition on show from 10th May to the 8th September 2013 at the NGV (National Gallery Victoria). It’s a very personal image. Monet would later recall that one day in 1874, as he and Renoir painted alongside a pivotal figure in the transition from realism in art to impressionism Édouard Manet (1832-1883), that Manet glanced over at Renoir and his canvas and at one point walked over to Monet and whispered: “He has no talent, that boy! Since you’re his friend, tell him to give up painting! 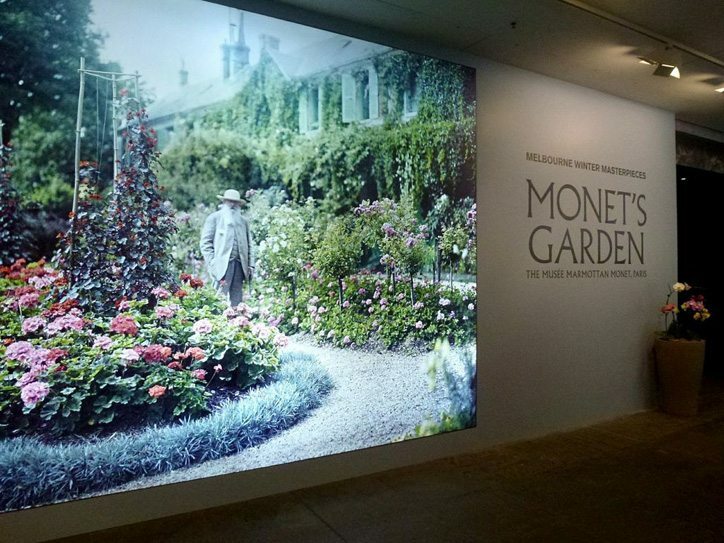 There is no doubt the winter masterpiece exhibition Monet’s Garden at the NGV will add a great deal of colour, light and warmth to Melbourne’s coldest weather season, refreshing the hearts, minds and souls of many people as they gaze at a well-chosen selection of works. French artist Claude Monet (1840-1926) created his own ‘Arcadia’, his own slice of heaven on earth a sensational garden surrounding his house at Giverny in Normandy. 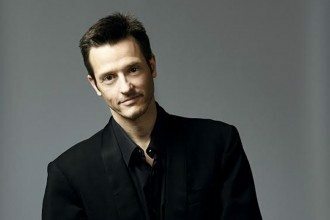 In that special place he exquisitely organized nature for over forty years, creating a sanctuary for his family, as well as a place of inspiration for his work during the second half of his artistic life. The Impressionists as Monet and his colleagues became known, brought about a painterly pleasant French revolution during the second half of the nineteenth century. 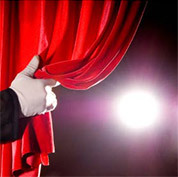 Their promise was, that if you did decided to follow their lead you would be able to trust that you were seeing an optimistic view of a life well lived. 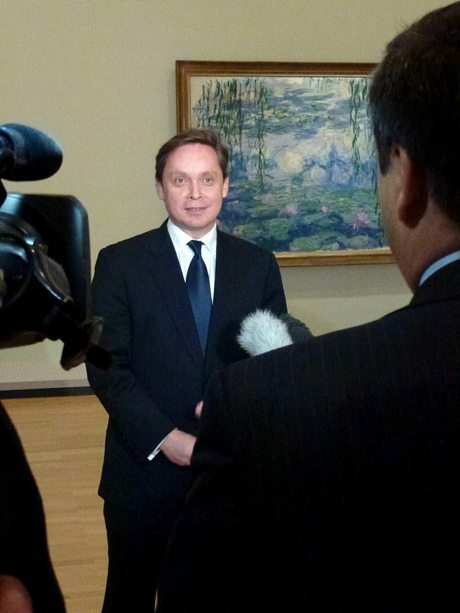 Acknowledging the generosity of the Musée Marmottan Monet, Paris in lending the Renoir, plus fifty masterpieces by Claude Monet to showcase alongside additional paintings of his, which have been gleaned from leading international museums and other private collections, the Director of the NGV Tony Ellwood could hardly contain his own excitement at the prospect of this splendid show at the media launch. 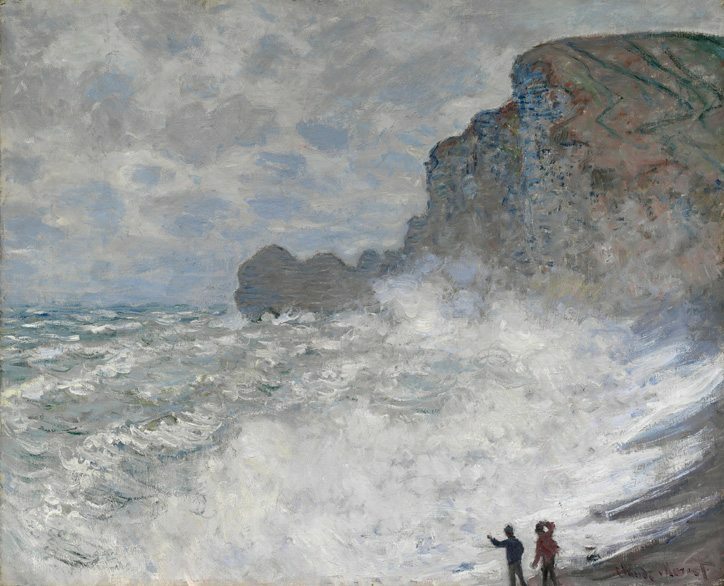 Claude Monet and his colleagues in their lifetime gradually introduced the warmth of an idyllic life by opening doors and windows onto a different world in art, one that gave an impression of a real sky and imbued the viewer with just a fleeting sense of the freshness and lushness of the French countryside. 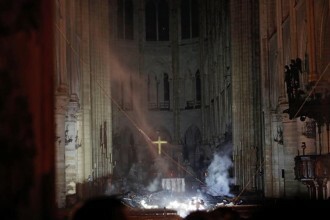 They provided us with imagery that remains today as a constant reminder of the power of nature, beauty and creativity. 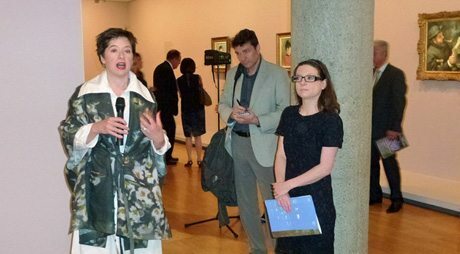 Marianne Mathieu, Assistant Director and Curator of the Musée Marmottan Monet, Paris who was in attendance along with her colleague Sophie Matthiesson, and Curator of International Art at the NGV have curated this splendid show. They both gave an erudite evaluation about the works on show and provided many interesting anecdotes about Claude Monet and his life. This is an exhibition sure to please, made accessible to the public by the contribution of a great team of supporters and sponsors. 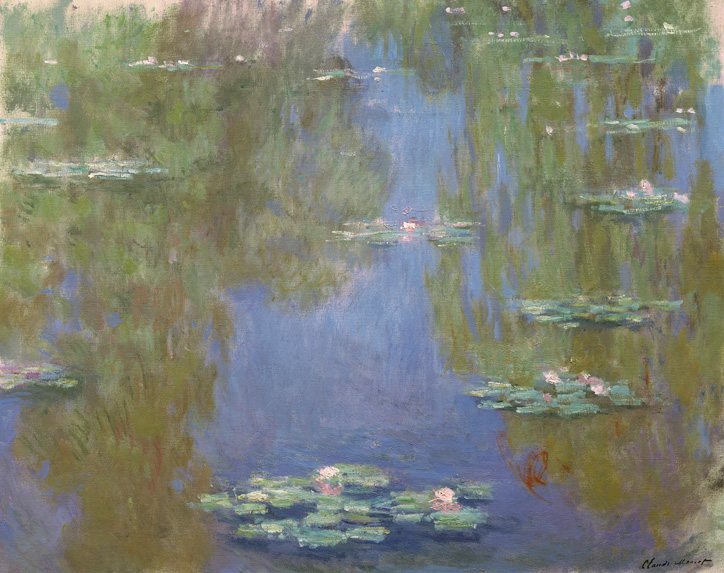 The show has been beautifully assembled to take visitors on a leisurely, achingly wonderful journey in art; they walk in Monet’s footsteps as they encounter his works, which have as he intended, always remained fresh and full of possibilities. Monet’s flora world is a fascinating fairyland, one imbued with the fragrance of blossoms, which have been subtly blended from soft silky colours ranging from pure white to creamy yellow, from pink to red and shades of lavender and purple. Under Monet’s influence light shimmers and palpitates. 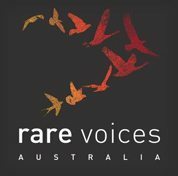 In his lifetime it became necessary for like-minded artists to experience and express more fully on canvas, the sound of the wind in the trees, the trembling of the leaves, the waving of a single flower in the breeze, as well as the misty soft haze of an early morning gently caressing the landscape. No one else has ever really captured the illusionary mesmerizing momentary quality that this original group of late 19th century French artists managed to do as they set about brilliantly conveying their first and lasting impressions. A passionate lover of nature, which he claimed was his greatest teacher and source of inspiration, Monet observed that the ‘poor palettes’ of the painter could not capture fully the colour of flowers. 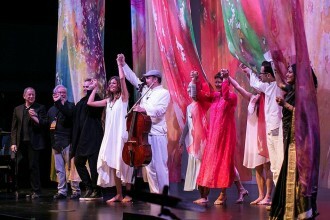 Instead he made a ‘living palette’ of flowers conveying the effects of luminous haze, rippling water, sunny winter scenes, springtime landscapes and restful rivers in summer. 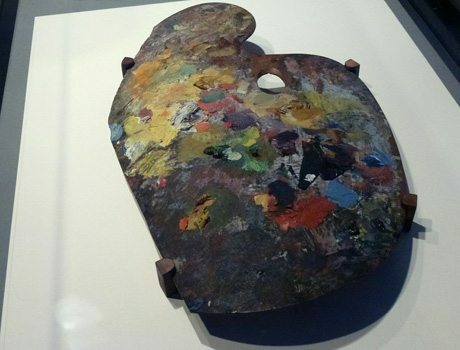 Keeping the personal touch, Monet’s eyeglasses, pipe and palette are also included in the display. Monet was a master of colour and texture not only in his painting but also in the art of gardens, which he practiced avidly. Impressionism infused painting with sunlight and fresh air, introducing its admirers to the great outdoors, pouring light onto canvases where none had shone before. 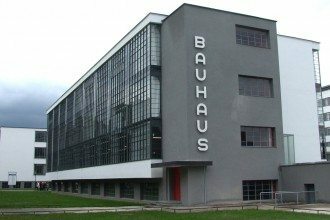 There was an individual expression containing spontaneity and sensuality in a style that brought brilliance to colour palettes that had previously only known sobriety. 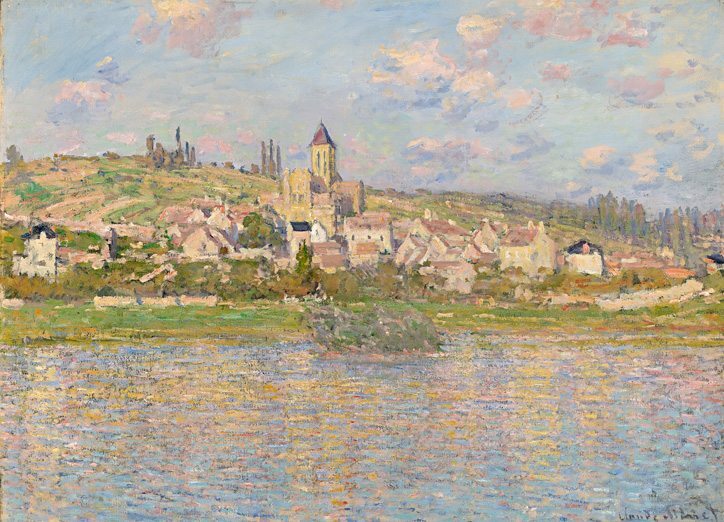 Monet was born ‘undisciplinable’ a word he used when describing himself as a child. He did not ever ‘stick to the rules’ of either art or of society. He broke them, a lot of the time as a completely conscious act. As a young man of 15 years he worked in Le Havre as a caricaturist, his sense of humour appreciated by all who viewed his work. After a while he discovered that people were willing to pay him a fee for his funny portraits, which upset his family but made him laugh with delight. Monet spent his youth in Le Havre, where he had a chance encounter with the painter Eugéne Boudin (1824-1898) in his framer’s workshop. Boudin was one of the first French landscape artists to paint outdoors and became noted for his seascapes. He encouraged Monet to work in the open air and to ‘spend his life expressing his own instinctive way of seeing the most subtle nuances of colour, atmosphere and light in landscape’. He took the young rebel under his wing, mentoring and advising him as well as introducing him to nature, which would become his greatest source for inspiration. Under his influence, and with a considerable sum of money to hand from his first encounters with commerce, aged 16 Claude Monet set off for Paris, where he planned to expand both his education and horizons. He observed later in life that at the time he didn’t really have a ‘care in the world’. His mother had died during the year before and he was ready to make his way in the world. Boudin remarked that Monet set everyone an example ‘by holding fast to his principles’ and Renoir said ‘without him, without my dear Monet who gave us all courage, we would have given up’. 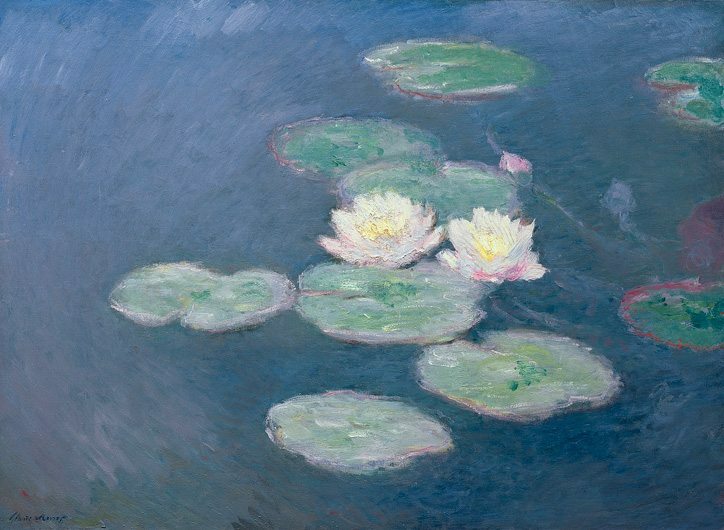 The works on show are hung on a background of the pastel colours that Monet so loved. The show itself is divided into three sections; the first part is of works produced during the early years, when his garden at Giverny in Normandy was first being realised. 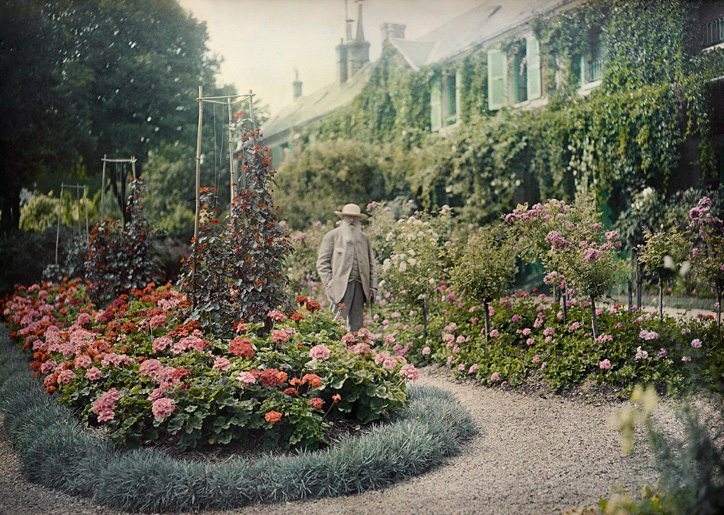 Monet was already 50 years of age when he took on the task of transforming the well-used vegetable patches and fruit trees in the garden of the house he finally purchased at Giverny in 1890, having rented it for some years beforehand. He also purchased land adjacent to his garden and converted that into the now famous water garden, where the willows gracefully wave in the breezes and frame the loveliness of his water lilies when they are in bloom. Water lilies, with their enchanting flowers and magical floating leaves, are spellbinding aquatic perennials that light up all water features with their wonderful waxy blooms. 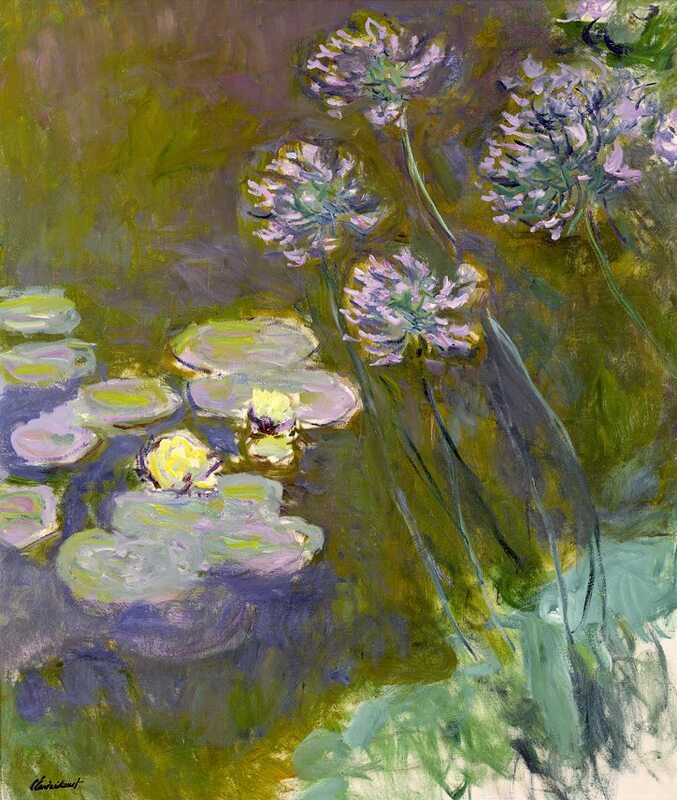 Monet recorded some 250 scenes of water lilies in his pond at Giverny in every sort of light source and season. This section also includes scenes recorded on his travels to Norway and London, including his well-known ‘Houses of Parliament, reflections on the Thames’ 1905, revealing his early fascination with painting water. 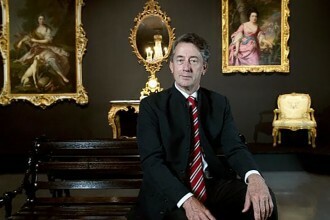 While he was in London he came up close and personal and was both impressed and inspired by the art of William Mallord Turner and also the 17th century French artist Claude Lorrain, whose works had been collected by young aristocratic Englishmen on their Grand Tour in the eighteenth century. During his time at London Monet produced nearly one hundred canvases, which he continued to work on in his studio at Giverny on his return home. The second stage of the show consists of works produced between 1897 and 1925 recording his now famous garden, especially the ‘water lilies’ and the Japanese style influenced delicately draped with wisteria footbridge that spans his water garden. The Japanese believed that in a garden the viewer filled in the picture for himself or herself. 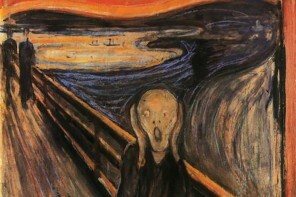 So did Impressionism. 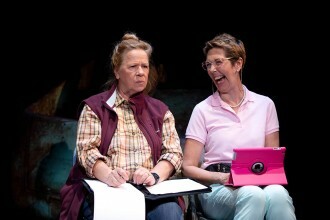 It actively sought that type of reaction from the viewer. 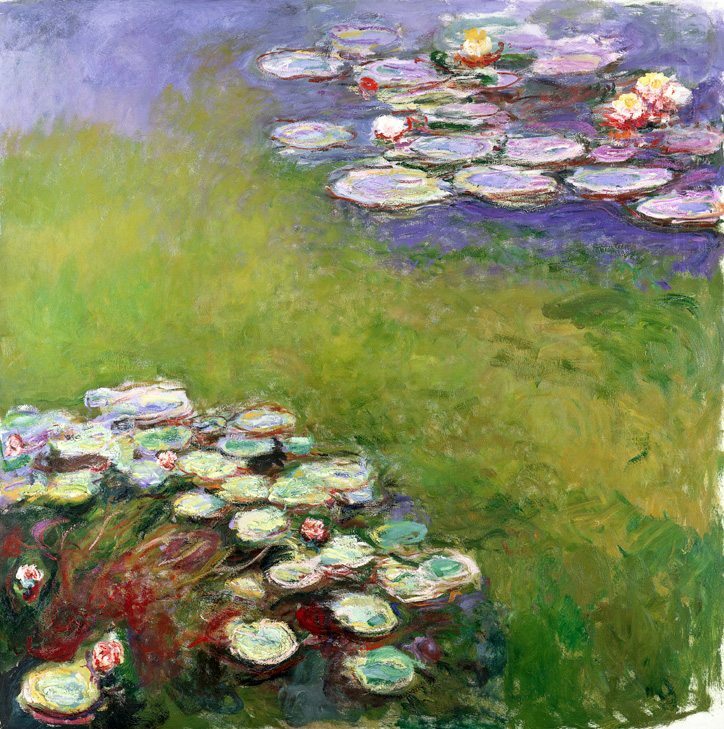 Dubbed a poet of nature Monet said ‘I have again taken up something impossible – water with grass rippling at the bottom. It’s fine to look at, but it’s madness to want to paint it. Oh well, I’m always getting into such things’. His water garden became a garden of perspective and of the unexpected. It had an affinity with 17th century Japanese gardens with their lakes, winding paths and points of contemplation. It was a ‘dreamlike setting’…and ‘extremely oriental’ and he enhanced its atmosphere with a collection of bamboos, Acers, Japanese tree peonies with large single flowers of red, dark red, pink and white, weeping willows and every known variety of water lily. His passion for it never abated, the flower garden was the yin, the water garden his yang. This section also includes the paintings he called his ‘flowering gardens’, which dissolved substance and reality in light and colour, his fading eyesight causing him constant distress. These works provide a unique opportunity to explore a lesser known period of the artist’s life. 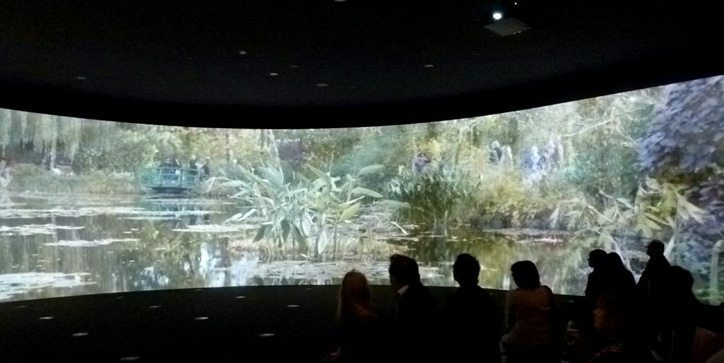 The third and final aspect is the awe inspiring surround-sound panoramic screened theatrette where, at the end of the show, you can encounter the reality of Monet’s Garden today. Filmed during the final days of the summer season last year, accompanied only by beautiful music, The Last Day at Giverny provides a magical moment for the viewer to pause and feel the harmony with nature Monet felt, as his garden transformed from sunrise to sunset. 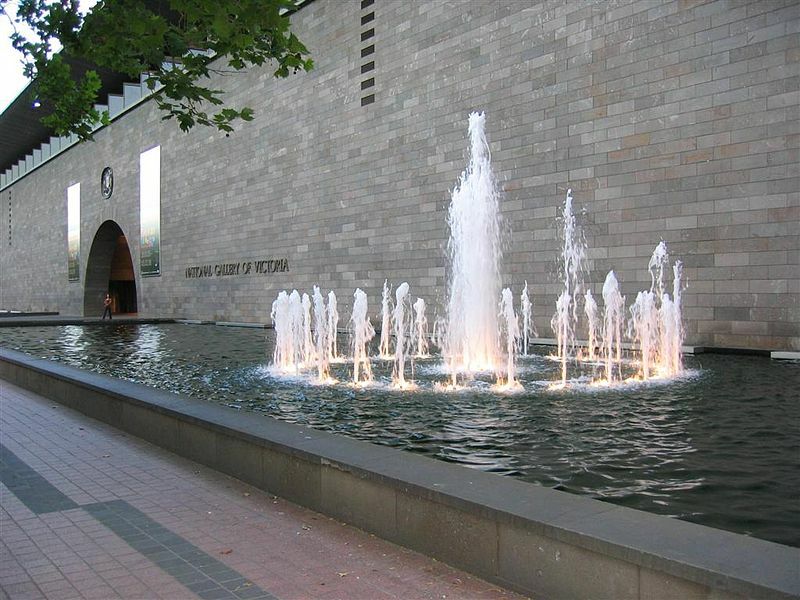 NGV Director Tony Ellwood commented, “… It will embrace visitors, leaving a powerful parting impression of Monet’s Garden”. Monet corresponded with Dutch, Japanese and American horticulturists, he studied plant catalogues, went to flower shows and read County Life magazine from England where his vast vision of nature inspired others. He experimented with living colour, using traditional flowers as colour fields rather than for their individual beauty and form. He employed the same principles in his garden as he did when approaching works on canvas, creating richly patterned textures, many different moods suiting the times of day and harmonizing all his colour relationships. Blue was his favourite colour for flowers, so rare in nature. He collected small blue flowers and hid them in places where they shone secretly in the shadows of the garden. He also mixed them with violet, or set them off against yellow, much like he did at home in his decor and paintings. 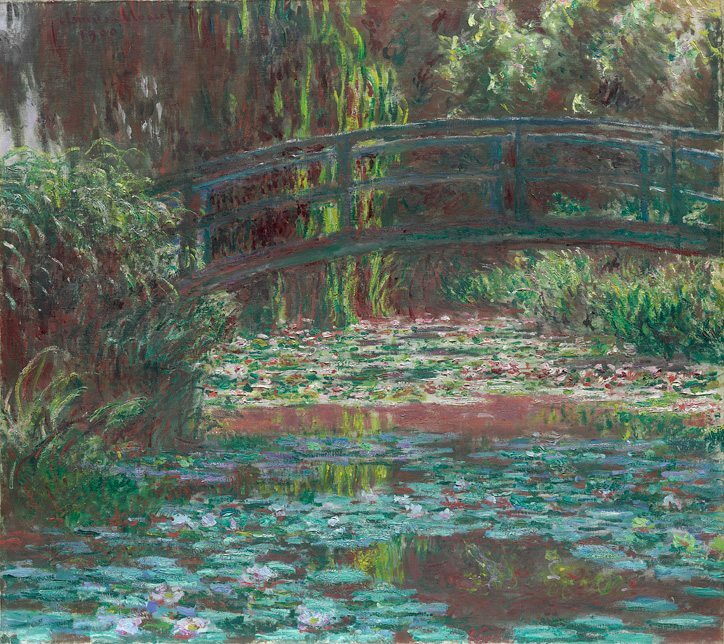 In the water garden Monet created a moist green world of winding paths and curved bridges where the floating water lily pads shimmered in the light, glittering like precious jewels as they glided gracefully over the water’s surface, reflecting each nuance of atmospheric change. 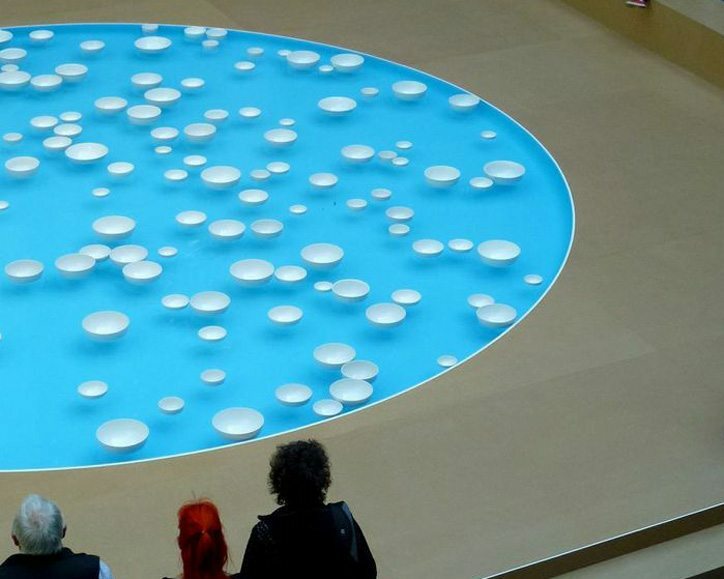 This idea has been taken up beautifully out in the Federation Court before you arrive at the exhibition, where contemporary French artist and composer Céleste Boursier-Mougenot has created a stunning installation of white ceramic bowls floating upon an intensely blue pool of water. 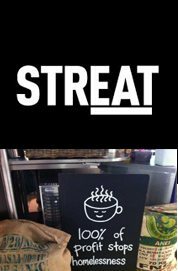 They glide gently over its surface, the floating crockery bringing art and music together in a chiming acoustic soundscape of great delight. 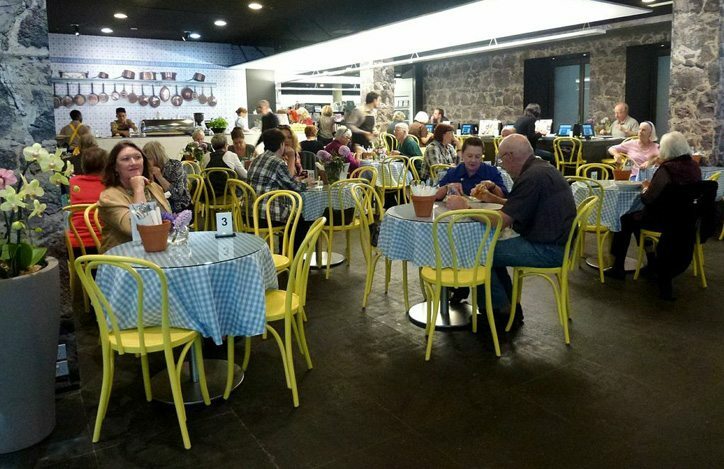 As you emerge out into the life and light of exhibition the ground floor café at the NGV has also been transformed, taking its inspiration from Monet’s kitchen at Giverny and his favoured colours of blue and yellow, which has come to be symbolic of French Country style. 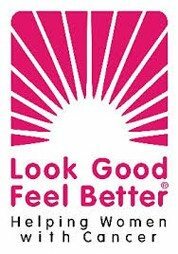 This is where you can also enjoy French style food so that you can complete your experience of having spent a pleasing day in the French countryside. Claude Monet taught us all that over time our relationship with place, plants and the light would change us forever. He walked in his garden every day, noticing everything. He would watch the changing light, the cumulus clouds overhead and his water lilies floating about on the pond, enjoying a moment for meditation, for connecting with his environment and for personal reflection and inspiration. Above all he let us know just how important it is to be in touch with our own surroundings and ever present within them. Go and see this splendid show, so that you can better understand for yourself, just how wonderfully well Claude Monet closed the gap between the dreamer and the dream.